That's Why We Don't Eat Animals. New Children's Book. 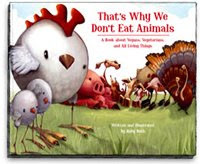 There is a new children's book called That's Why We Don't Eat Animals: A Book About Vegans, Vegetarians & All Living Things. Written by Ruby Roth, the book explores the vegan and vegetarian side of life and attempts to explain to children the reasons why: we don't eat animals. It's a controversial book which communicates a strong message about a vegetarian diet. The book has been endorsed by Jane Goodall, Alicia Silverstone and it also has some impressively cute illustrations. What do you think? Is this merely vegan propaganda? "A chicken is no bird-brain! Chickens fall in love, want their families, and like to have fun. A hen doesn't lay breakfast eggs, but eggs she believes will one day be her babies. That's why we don't eat animals." "Pigs are extremely intelligent and sensitive-so sensitive that they can even have their feelings hurt! Their excellent memories and problem-solving skills make them some of the smartest animals in the world. In many cultures, pigs are admired and considered symbols of good luck. As a vegan interested in kids health and proper nutrition, I like this book. I like the idea that parents can have a book to read their kids if they choose to. If a parent or family friend is vegan and wants to explain it to their children, reading a book - with illustrations really helps. I do not think this book is appropriate for a public education program, but for a family interested in exposing their children to a vegan state of mind at a young age, this is a book that fits the bill. And from my research, all of the statements made in the books about animals are true. Nothing spun too harshly here. It a brave step for such a young author as Ruby Roth. Some of my cooking book favorites.